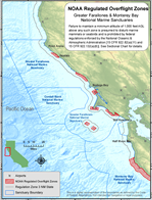 This poster is made for airports, flying clubs and hangars to inform pilots about overflight regulation areas in CA national marine sanctuaries. Do you fly a plane in California? Then this map is important to have on your tablet or in your plane! Sanctuary overflight regulation areas require 1,000 foot minimum altitude in specific areas. Interested in seabirds? 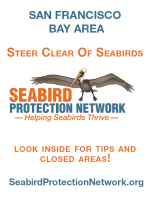 This great brochure gives an overview of seabirds that breed in the greater San Francisco area and discusses some of the threats they face today. Interested in seabirds? 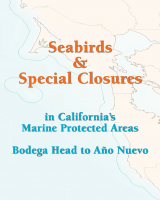 This great brochure gives an overview of seabirds that breed in the greater San Luis Obispo area and discusses some of the threats they face today. This poster is made for harbors, marinas, boating shops and yacht clubs to inform boaters about how to be “seabird safe” while out on the water. This poster is made for paddling shops, rental locations and paddling clubs to inform kayakers about how to be “seabird safe” and minimize your impact to marine wildife while on the water. An important resource for boaters and fishers alike! This map details marine protected areas, which affect where you may go and what you may or may not remove from specific areas. This small waterproof guidebook is great for on-the-water activities! In addition to maps of each of the Special Closures located along the North-Central Region, we’ve included 16 species of seabirds that you might see on your adventure. These pocket-sized tidebooks cover the San Francisco Bay and Delta and outer coast. Also included are tips for boaters on how to boat “seabird safe” and also information on where no-access areas prevent entry to all watercraft. These wallet-sized tidebooks (for either San Francisco or Monterey Bay) and outer coast. Also included are tips for boaters on how to boat “seabird safe” and also information on where no-access areas prevent entry to all watercraft.